policy and practice? Can we gain new insight by debating the various outcomes of sustainable architecture and urbanism? 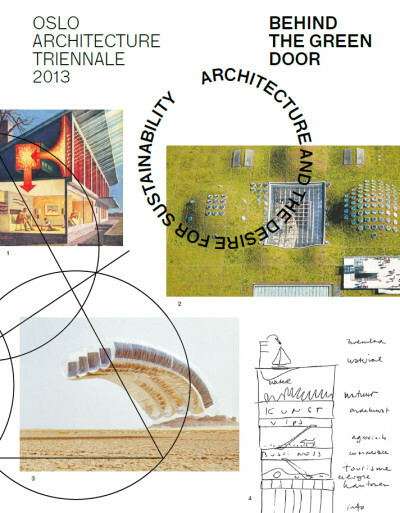 The Triennale catalogue is a critical and playful investigation of sustainability’s influence on architecture over the last 70 years. The catalogue, which is in English, contains texts and images provided by curators Rotor along with selected authors and guest writers. portrays the prevailing green wave in architecture and the many controversies that surround it. 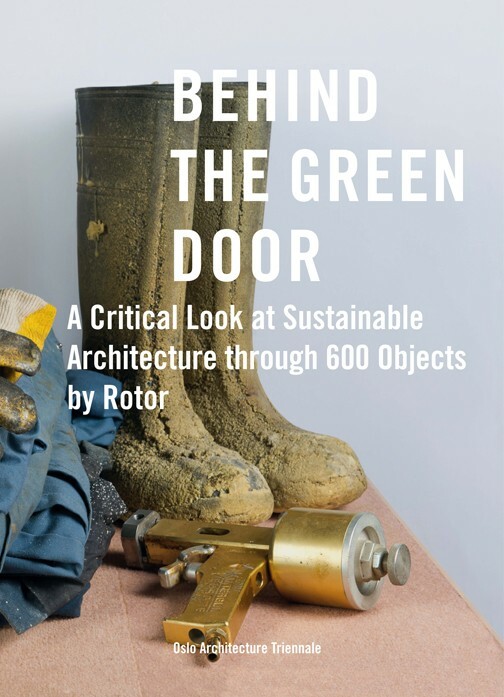 600 supposed sustainable objects are presented and discussed over 368 pages. The book is enriched with comments from over 100 international experts. us to forsake all pleasures, and the cynics who want to earn money on quick-fix technological solutions. universities, ecovillages, government and non-government agencies and the United Nations. "From the questions' design we smoothly moved to the experiments with the seeds and the seeding paper. We wanted to find out inside of which of the three types of rice paper (really thin one, a bit thicker and the thickest), the seeds of Garden Cress and Rucola, will grow better and faster. Our team also used special organic potato glue totally free of any preservatives, so it would be possible to glue two pieces of paper together, creating a small seed bag. This way it will be really handy to place it on top of the ground or directly into it". The questions in Casting Doubts are based on earlier research by artist Jasmin Moeller (The Reality of Theory) and are inspired by the essay "The myth of artisthood by art historian Camiel van Winkel. In this work, van Winkel distinguishes three types of artists: Romantic, Modernistic and Beaux-Art. Answering the questions does not only serve to start a conversation, but also show what kind of artist you would have been. Do you identify more with Van Gogh, Marine Abramović or Miss Van?" "Do you feel free? Do you break taboos? On May 5th (Liberation Day), join us in Casting Doubts: help sow Amsterdam’s newest hot spot: Dijkspark. Thirty questions about life and art lead you along the green walkway. As the audience, you answer by sowing seeds. This way, in the summer your answers grow into a a lush infographic. With Casting Doubts, Jasmin Moeller, Masha Ru and Mediamatic present a new public space installation. The opening is from 16:00 until 19:00. Concurrently, Dijksgracht will host the Freedom Meals. Drop by for a drink and get a nice snack from one of the stalls. Casting Doubts asks thirty questions during a walking tour through Dijkspark. Large flower pots have been set up in a grid and show the questions on their sides. As a visitor, you are supplied a punch card containing flower seeds. 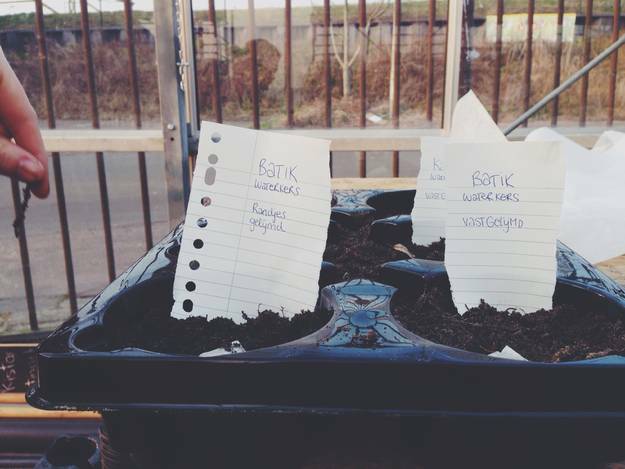 You answer by pushing the appropriate answer seed from the card into the flower pot, sowing your answer in the ground. At the moment, Dijksgracht’s head is under much development. 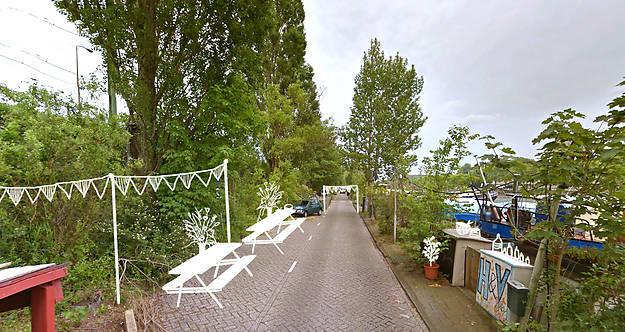 Local residents, together with Klimmuur Centraal, Hannekes Boom, Barco Restaurant, the Shaffy Tuin and Mediamatic are working to keep Dijkspark bee-friendly, biodiverse and (mostly) free from cars. The Casting Doubts project is one of many initiatives to contribute to this goal. In our selection of flower seeds, a beekeeper was consulted. Casting Doubts opens Tuesday May 5th, Liberation Day, when we celebrate freedom. Concurrently, Dijksgracht will host Streetdiners, as a part of the May 4th and 5th Freedom Meals. More information on the program, the participants and the meals can be found here".